The race to buy collapsed music chain HMV has a new front-runner after a surprise intervention from a Canadian entrepreneur, media reports say.The latest rescue bid is said to come from businessman Doug Putman, owner of Canada's Sunrise Records stores.The move pits him against Sports Direct founder Mike Ashley, who has also placed a bid.HMV collapsed in December, its second administration in six years, risking 2,200 jobs at 125 stores.Those stores are continuing to trade while negotiations are held with major suppliers and bids are considered. The reports of Mr Putman's interest first surfaced in trade paper Music Week on Saturday. Administrators KPMG declined to comment. Mr Putman previously bought HMV's Canadian business in 2017, expanding his small chain into a national operation with 80 outlets.His bid would secure the future of up to 90 of HMV's 130 UK stores, reports said.However, Music Week suggested that the HMV brand could disappear and be replaced by Sunrise's if Mr Putman's bid was successful.The paper said that although HMV Retail was in administration, HMV Brands, which controls the rights to the name, was not.KPMG confirmed that HMV Brands was not in administration, but declined to comment further. 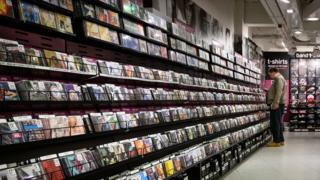 Did streaming finish off HMVMike Ashley: The saviour of the High Street? Until now, Mr Ashley had been the likely favourite to take over the music retailer.As the owner of more than 60% of Sports Direct, he has bought retailers including the House of Fraser department store chain and Evans Cycles.His company also owns stakes in French Connection and Debenhams.HMV owner Hilco, which took the company out of its first administration in 2013, has blamed a "tsunami" of retail challenges for the latest collapse. These include business rate levels and the increasing use of streaming services to deliver music and movies.HMV sold 31% of all physical music in the UK in 2018 and 23% of all DVDs, with its market share growing month by month throughout the year. However, the music industry expects physical entertainment sales to shrink by another 17% this year.